Remote monitoring requires the usage of the most suitable communications infrastructure available at the remote location. While GSM networks are ubiquitous they do not always provide complete coverage, whereas satellite coverage is essentially global. Omniflex has therefore added a satellite communication option to its Teleterm M3 series, to provide a more effective data gathering capability in hard to reach locations. 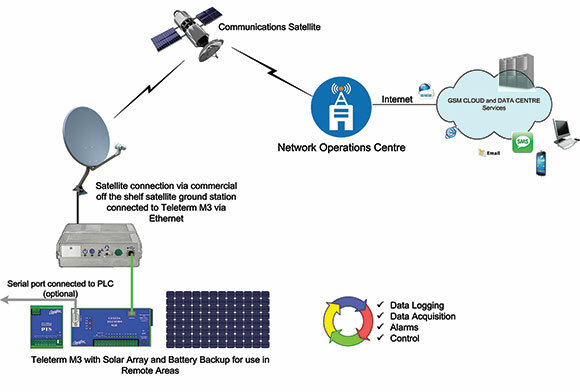 The satellite link provides the Data2Desktop Omniflex Web based data portal with a second communication option in remote monitoring applications. Teleterm remote monitoring users now have the choice of either a satellite or a GSM link, depending on the infrastructure availability. While satellite communication services are more expensive than GSM, its cost benefit ratio is still attractive in many remote monitoring applications. • Global data coverage globally. • Quick installation and implementation. • Low power consumption enables solar power usage. • Operates off 12 or 24 VDC supply. • Easy field installation for antenna. • Receive Data2Desktop SMS commands.